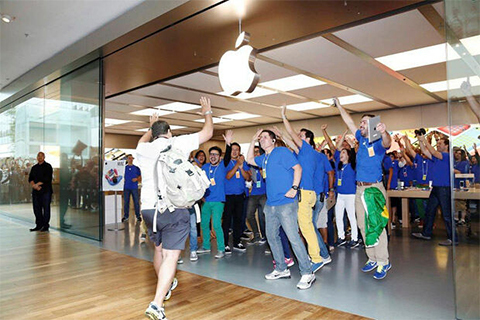 This weekend, Apple opened it’s first retail store in Brazil “Rio de Janeiro”. Customers started queueing up on Thursday night for the Saturday morning debut. Approximately 1,700 customers waiting in line for the grand opening with groups waiting both inside and outside the Village Mall. The store features a split-concept layout where one half of the store is dedicated to product demonstrations while the other half is focused on accessory sales and services. Because of high taxes, the store in Rio de Janeiro is the most expensive Apple retail store, with the iPhone 5S starting at the equivalent of $1,174.